In 1990 an expedition of Cambridge scientists arrived at the Plains of Ne- chisar, tucked between the hills of the Great Rift Valley in the Gamo Gofa province in the country of Ethiopia. On that expedition, three hundred and fifteen species of birds were seen; sixty one species of mammal and sixty nine species of butterfly were identified; twenty species of dragonflies and damselflies; seventeen reptile species were recorded; three frog spe- cies were filed; plants were listed. And the wing of a road-killed bird was packed into a brown paper bag. When the specimens finally arrived at the British Natural History Mu- seum in Tring it set the world of science aflutter. It seemed that the wing was unique, but they questioned, can you name a species for the first time based only on the description of a wing, based on just one wing? 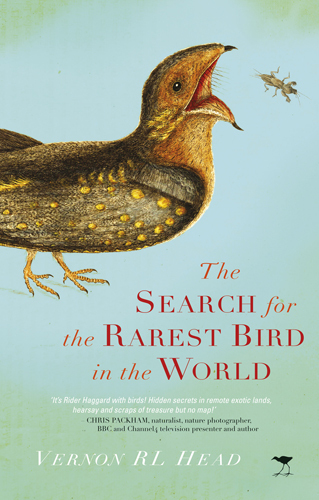 Twenty two years later an expedition of four led by Ian Sinclair set off to try to find this rarest bird in the world.